Respect: probably one of the most basic concepts that we are taught at a young age. We are taught to respect our elders, to respect our teachers, to respect our superiors. However, I hear it all the time though that the younger generation just doesn’t have the respect for others that older generations do. I don’t think that is necessarily true. 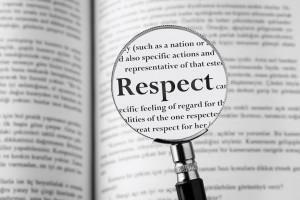 We have all been instilled with the concept of respect, and it is something I pride my firm on demonstrating to every client or potential client. This is one of the most essential undertakings for a lawyer to commit to. By listening not only are you getting the information that you need, but you are also showing clients that you aren’t tuning them out. Most of the time clients hire an attorney because they are going through something extremely difficult in their lives. At times, clients can get upset, especially with difficult case matters. It is extremely important to always be patient, which is the best thing for the client and his or her case. Be appreciative of a client allowing you the opportunity to work with them. The practice of law is a business, and you should be appreciative a client has chosen you to represent them. This is important not only when dealing with clients, but with anyone in the legal field. Politeness can open up doors that you might not think of. As experts in the law, we must always stay abreast of legal changes. By doing so we ensure that we are providing our clients the best representation, and thus, are respecting their needs by knowing the law. If we do not follow through on what we have said we would do, we have ultimately failed our client. This can never happen, and can make for very unhappy clients and an unsuccessful legal career. It is often said that respect must be earned. Simple steps can ensure that you show clients respect and earn theirs in return.